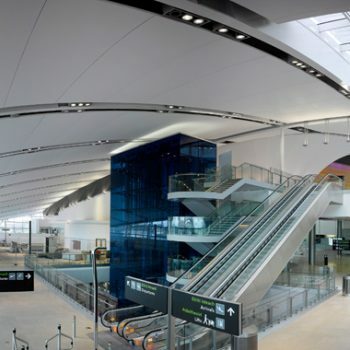 In 2014, Fabric Architecture supplied over 25,000sqm of tensile fabric ceiling panels and interior tensile features at Dublin Airport. 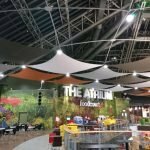 The fabric ceiling in Terminal 2 at Dublin Airport is an excellent product and looks as good today as it did the day it was installed. There has been no sagging or staining and we’ve had no issues with it at all. We did a lot of trialling and testing before making the final selection and we are really happy with the product. In fact, the fabric ceiling is one of the main architectural features in Terminal 2 and it’s hard to imagine T2 without it. Colm Moran, Chief Asset Management & Development Officer, Dublin Airport Authority. 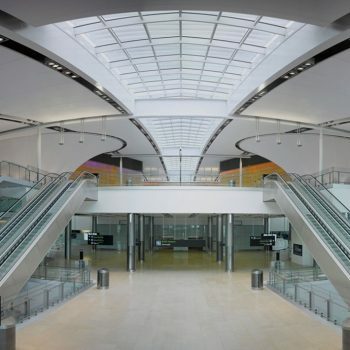 One of the key decisions made for the Dublin T2 project was undoubtedly the selection of a fabric ceiling for the main public spaces. Every passenger, arriving and departing, circulates through the main curvaceous volumes with a clear view of the dramatic roof soffit. The fabric ceiling not only captured our architectural aspirations to create a bright and spacious internal environment but offered an extremely cost effective solution. 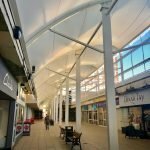 With the close engagement of the client’s operational and maintenance teams we were, with Fabric Architecture’s considerable technical expertise, also able to demonstrate that the fabric ceiling not only fully satisfied that architectural brief but met every aspect of the technical challenges for future maintenance, cleaning etc. 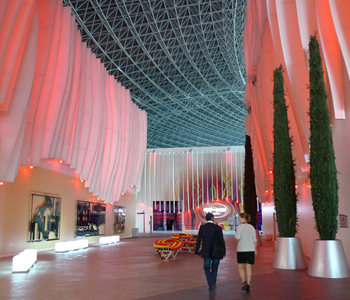 Over 100km of extruded aluminium, 50km of extruded plastic and 45,000m2 of tensile fabric was used in the manufacture of 2063 unique interior “fins” for Ferrari World, Abu Dhabi. 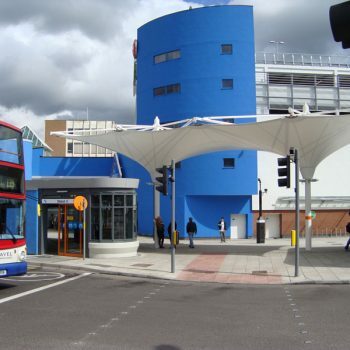 We were pleased with how the project developed and the conduct and performance of Fabric Architecture. 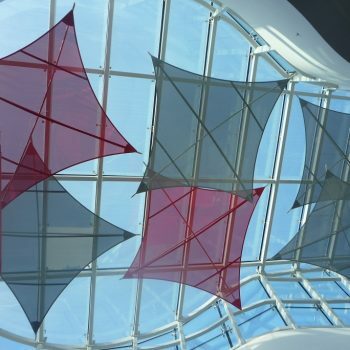 Fabric Architecture were asked to provide a solution to reduce solar glare inside the glass atrium at Cummins Inc. HQ, in USA. 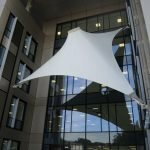 The company designed and installed a series of lightweight tensile fabric hyperbolics, suspended from the framework with high grade 316 stainless steel fixings. The end result was exactly what we were expecting and perfectly fits the design brief – it exceeds our expectations. 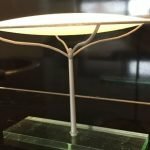 It was the sun-plots of the shade performance that was crucial in securing the project’s success. The installation was flawless. 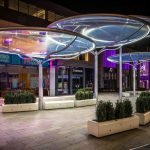 The canopies have exceeded my expectations both in aesthetics and functionality. 5 years on the structure still looks crisp and modern with only annual maintenance required. The shelter the canopies provides to both public and dogs is far greater than I expected, keeping out much of our heavy rain and wind. 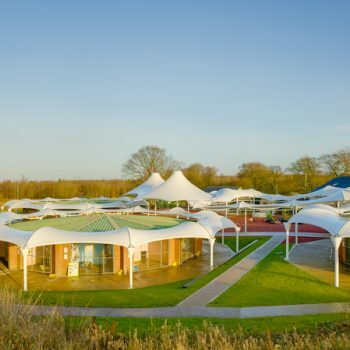 I love the design, the change from one canopy structure to another and how these flow and guide you around the site. 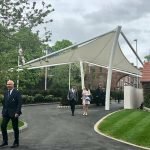 The canopies have not just provided the shelter we required but have brought our rather tired and fragmented centre together and provided a sharp, modern facelift. 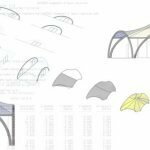 Everyone at Fabric Architecture were very professional in their approach and both the design and site installation was of the highest standard and of superior quality possible. 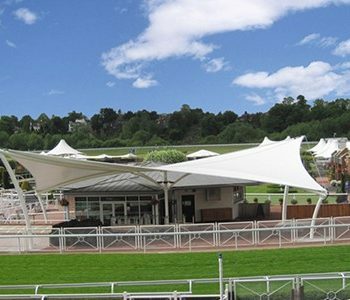 Fabric Architecture provided another beautifully practical tensile solution for Chester Racecourse when they installed a series of tensile fabric products from the Signature Structure range. 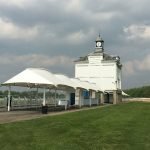 The ready-to-install canopies provide a cost-effective yet premium-specification option for end users across a variety of sectors.